In 12-inch skillet, heat 1 tablespoon of the oil over high heat. Cook ribs in oil about 10 minutes, turning frequently, until brown on all sides. Discard drippings. Place ribs in large roasting pan. Cover and bake 1 hour; drain. Meanwhile, in same skillet, heat remaining 2 tablespoons oil over medium-high heat. Cook onions in oil 10 to 15 minutes, stirring frequently, until tender and brown. Stir in flour, coating well. Stir in thyme, broth, vinegar, brown sugar, salt and pepper. Pour onion mixture over beef ribs. Add beer. Cover and bake about 1 hour 30 minutes longer or until ribs are tender. 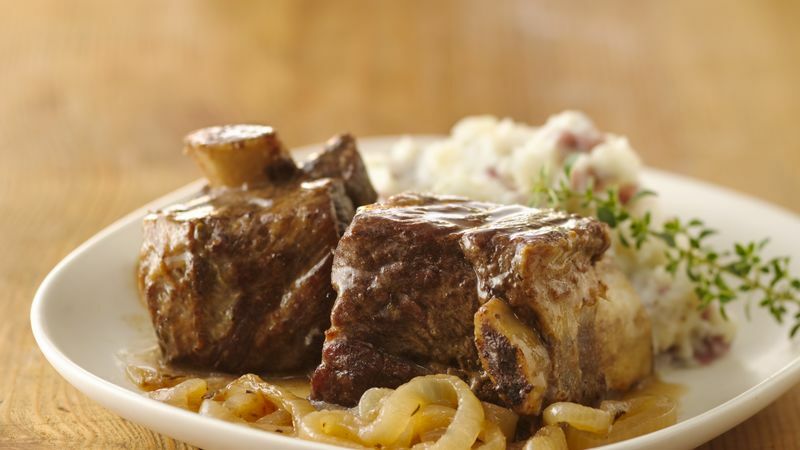 Serve ribs with pan juices.